An LG air conditioner window unit features a digital display and several buttons used to control the air temperature in the designated room. 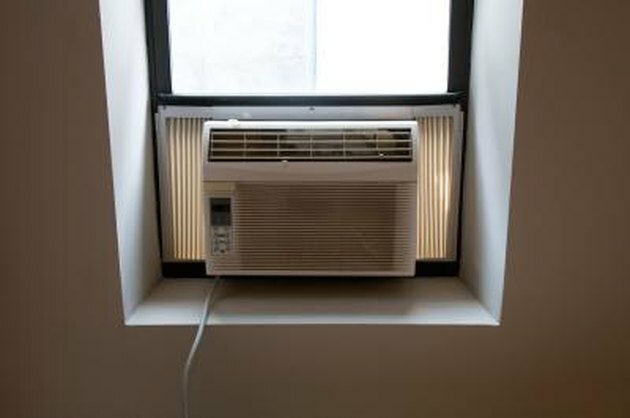 The unit is installed into a windowsill and blows cool air into the room as needed. Changes to the temperature can be made on the control panel of the unit or with the supplied remote control. To put the LG to use, you need to know which buttons perform certain tasks. Some LG units feature a heater as well as the cooling function. Push the "Power" button on the bottom, right-hand side of the control panel to turn on the air conditioner. Push the "Power" button again to turn it off. Push the "Fan Speed" button, located to the left of the "Power" button, continuously to cycle through the various fan speeds. A higher fan speed increases the cooling power. Choose between "High," "Medium" and "Low." Push the "Timer" button to the left of the "Fan Speed" button in order to access the timer feature. The LG timer can be set up to 12 hours to start and stop the air conditioner hourly. When activated, the timer indicator light illuminates. Push the "Timer" button again to turn the timer off. Press the "Mode" button on the bottom, left-hand side of the panel, until the desired mode is selected. Choose "Cooling Mode" to blow cool air, "Energy Saver" mode to blow cool air at an energy-saving rate, "Fan Mode" to deactivate cooling and enable only the fan for ventilation or "Dry Mode" as a drying function. Press the "Temperature Up" or "Temperature Down" button above the "Power" button to increase or decrease the temperature setting. An increase in the temperature setting causes the air conditioner to run less often. A decrease in the temperature setting causes it to run more frequently. The current room temperature is monitored by in internal thermostat. The thermostat features a fixed setting range between approximately 60 to 86 degrees Fahrenheit. Lift the tab on the back of the remote control to access the battery chamber. Insert two batteries into the chamber in accordance with the polarity indicators. Slide the cover back onto the remote control. Press the buttons on the remote control to operate the air conditioner from across the room. An LG AC remote control features a "Power" button, "Temperature" buttons, a "Fan Speed" button, a "Timer" button and a "Mode" button. The remote control buttons all operate in the same manner as the control panel buttons.